Things I liked: Everything about this pellet is perfect. By far the best, most accurate . They even look better than other companies or manufacturers pellets. high precision pellets. No other company should even be allowed to say that their pellets are HIGH PRECISION or MATCH GRADE except JSB!!! THERE is no other that comes close. Things I liked: Heavier weight therefore more energy. Things I would have changed: Not the best "fit" in several of my rifles. Things I liked: These pellets work great, groups are guaranteed. And at 33.95 grain the foot pounds are Over 50..great hunting pellet. Things I liked: Very consistent size. Accurate groups from my Remington 725VTR. Very heavy FPE when hitting targets. What others should know: These are very good varmint pellets, but the drop is significant in my break barrel 725! Learn your effective distance when using these! Things I liked: I have shot 300+ of these with my Huben K1. They seem to work well. No jams. Things I liked: Smashing power from my Benjamin Trail NP XL. Quite accurate, even at 50+ yards. Things I liked: I have tested many pellets in 25 cal for use in my brocock bantam sniper hr mk 2, and found that these pellets perform very well. I will be reordering this pellet again. Things I liked: Good quality. Works well in Sumatra Carbine at near highest power setting. Things I would have changed: Twist cap lid. What others should know: Need a high power gun for best results. Things I liked: Awesome pellet, my AT44-10's favorite round after experimenting. Had ordered 2 of these when on back order and waited about a month for them. (No big deal) but when I received them I cracked one open after using the rest of my 150 count of these to zero in and went on to the new tin. They gone from roughly 3/4 inch groups to 3 inch spreads. Had also noticed they fit real loose in my magazine and couldn't feel them engage the rifling. Went to look at the face of the tin and saw on the bottom it said " M 72/09" instead of the normal "\\\CZ\" that's been printe'd on all my other JSB tins both .22 and .25. Contacted PA and told them about my circumstance and confusion on why I got a different marked tin. Roughly 24 hours later maybe even less than that I got a email for a replacement tin free of charge no questions asked. Was even ready to provide pictures and even pay for another if need be due to knowing this can happen to anyone. This only further makes me loyal to PA! Things I would have changed: Not a damn thing. My hatsan eats these up! After my email to PA about my predicament I had gone and looked at the tin at issue again and noticed the face label was even faded like it's been old stock from JSB that musta got mixed in with a fresh shipment. Quite odd and a absolute first for me. What others should know: Have any legitement issues with any products you've purchased from these fine folk get ahold of them right away and they will most certainly help you out and take care of You! Only thing I have not bought from PA was my hatsan at44-10 when there was a veterans day sale only due to them being out of stock.. as much as I love it I do regret not buying it here cause I've bought all my stuff from PA. And to be honest.. PA had the better deal on it haha. First and last time I will ever shop elsewhere for my airgun needs! Things I liked: These pellets are so accurate out of my Condor SS that I dont buy much of any other pellet except to compare and these always win. Things I would have changed: They should be cleaner. I find them slimy and with lots of lead shavings in the tin. I always clean and lube them before shooting because if i dont they dirty up my barrel quickly. They should also make a screw on lid for that price. What others should know: Clean them and shoot them. By far the best pellets I ever shot. What others should know: top shelf ammo... I have found them to be near perfect. Things I liked: I use these in my more powerful rifles. They are excellent in my AT44 and BT65 both PCP's with over 40 F.P.M.E.... Very accurate and reliable ammo. What others should know: They are too heavy for a standard break-barrel rifle. Maybe an appropriate projectile for a more than 25 foot pounds muzzle energy rifle. What others should know: Excellent out to 50 yds then they really drop. Things I liked: Pretty good pellets.I have not had any bad or mis-sized pellets so far. Things I would have changed: Price.They are a little pricey. What others should know: I don't size each pellet like some do but I have not had any problems with this brand.They out perform the other brands I have tried. Things I liked: They are starting to group nice for me but it takes a little tuning. Things I would have changed: Nothing except the price. But I want everything for less. Things I liked: This pellet has transformed my Hatsan M-135 .25 Cal. into an actual shooter. The problem with Hatsan in .25 is that they manufacture an oversized bore. H&N has compensated for this by re-designing their Baracuda to accommodate for this (Hatsan now distributes H&N). 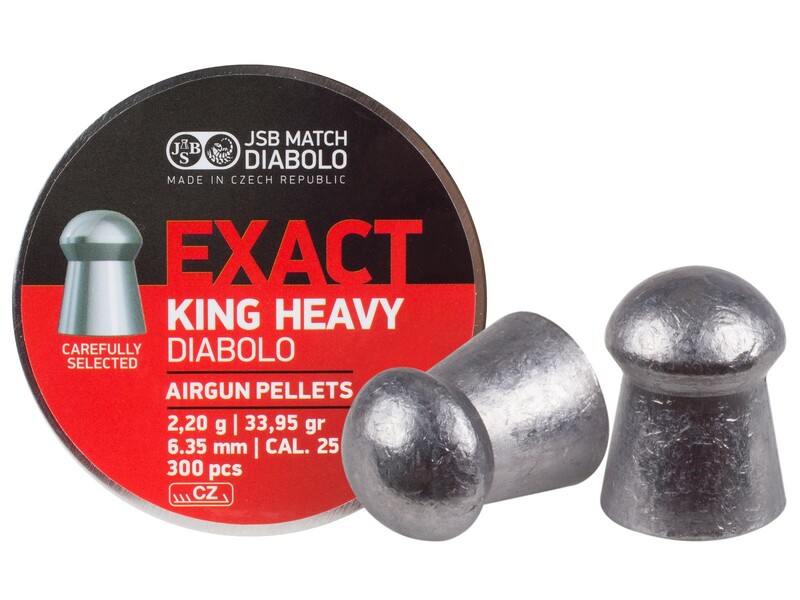 JSB, however, with the bigger all round pellet fits the oversize bore fully. Indeed, I use my venerable Beeman Pellet Seat Tool to "click" the Exact King Heavies into the breech. They have turned a "scatter gun" into a one hole RIFLE. It has been simply amazing! Things I would have changed: There is very little, if anything at all, to want to change. In fact, I absolutely hope that JSB DOES NOT CHANGE anything about this particular pellet as it is THE ONE that will engage the barrel of my Hatsan and has turned it into an accurate rifle. Okay, so I'll do the consumer typical complaint, "Reduce the price!" but that is somewhat disingenuous as they do precisely what they are designed to do and are worth every extra penny! What others should know: This pellet is exactly (pardon the pun) what one needs for an oversized bore, as common to Hatsan. It produces amazing down range energy as evidenced by my modeling clay "brick." I swedge the clay into a 3" by 3" by 8" rectangle. I blew threw the 3" side and had to shoot it end-on. The cavitation was 3 1/2" to the skirt of the buried Exact King Heavy. The PA calculator indicated some 30 foot pounds of energy. This is the go-to pellet for Hatsan .25s and any .25 that it will seat in the breech that have enough power to launch them. In other words, this pellet is not for the airgun that is "faint of heart!" Things I liked: Takes a little tuning but I've shot a one hole group at 50 yds. Accuracy out of my FX Impact is amazing!! What others should know: Experiment to find the best speed for these pellets. I'm seeing best accuracy about 860 fps max. Try 830 to 840 to start.